Follow Trojan Stream or Alma Stream, directly to Alma Col and climb loose rock straight up from the col. A bluff near the start of the route can be bypassed by a short, exposed traverse on a narrow ledge west of the ridge, or a rising traverse on loose rock on the east side. Either may require a rope. The south-west face can be used in good snow conditions. From the head of Alma Stream follow a snow gully directly to the summit. Not often in condition. 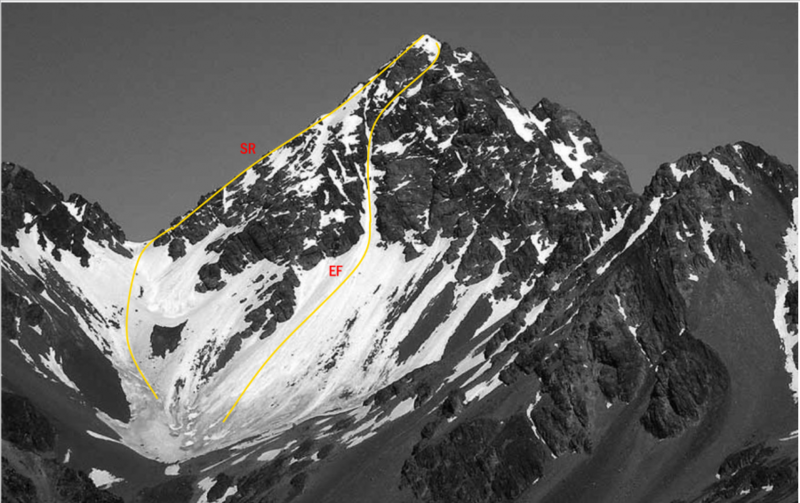 From Balaclava Basins at the head of The Growler follow a prominent east-trending gut leading through the bluffs to join the North Ridge shortly below the summit. From Balaclava Basins at the head of The Growler, take a steep couloir leading to a col on the West Ridge and follow steep but straightforward rock to the summit.